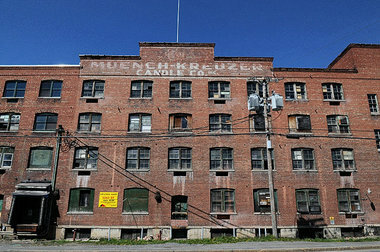 Dennis Nett/The Post-StandardThe former Muench-Kreuzer candle factory on Syracuse’s North Side is being converted into 40 apartments and some commercial space by developer Cosimo Zavaglia. His company paid $80,000 for the 60,000 square foot building at 617 E. Hiawatha Boulevard. Zavaglia plans to spend about $3 million on the project. He said the apartments will be ready for occupancy in August. You can tell what a person values by looking at his credit card statement. We vote with our wallets every day for what we think is important. Does anyone remember about 20 years ago when Walmart boasted about selling “Made in the USA” products? If you are too young to remember, you will have to take my word for it. Syracuse used to have a thriving candle manufacturing industry with five candle companies. Two brothers — Alexis and Norbert Muench — started Muench-Kreuzer in 1925. They were executives at another local candle company — Will & Baumer. Will & Baumer had been in the Syracuse area since 1855, but moved to Tennessee in 2009 to become a candle importer. Sadly, this is now a common narrative. Yet, there is a better way. Our culture has declined to a point where many consider price ahead of all other factors. As a result, the small businesses are vanishing, and the “big box” importers are growing. While many shoppers are willing to spend their money locally, they tend to only do so only if they are still buying at the cheapest price. Compare the handling, counseling, convenient location with atmosphere and specialized customer service of a “brick and mortar” store with the new competition— a warehouse out in the middle of nowhere paying very low property taxes, serving anonymous people and are structured with all the charm of a vending machine. The efficiency ratio doesn’t allow the small local retailers to compete unless they cut themselves off their own payrolls. While shopping on the Internet is continuing to become more popular, there will be a greater price to be paid later when the local “mom and pop” stores vanish and the Internet is the only option for any buying or selling. It was heartwarming when a customer came into my retail establishment, (www.backtobasicsbooks.com) and asked me if we had any Christmas Cards printed in America. That made both my customer and me happy. Ironically, for decades Bibles were banned in China, yet the largest number of bibles are printed in a country that contradicts the teachings of the Bible. Although it may seem fashionable to shop on the internet, it will be more satisfying in the long run to preserve some of the local options by voting locally with your wallet this December. A community is more than a location. It is about helping each other and linking arms to move forward together.